« The return of the white whale… Migaloo! 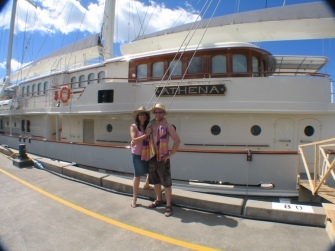 The other big news in Cairns this week is the arrival of the Athena, a massive sailing boat. 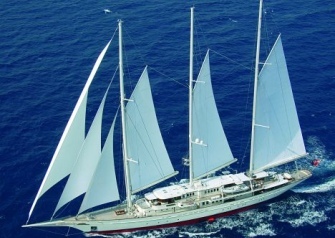 The Athena, 90 metres long with 60 metres masts, is the largest three masted schooner in the world. Here you have two beautiful photos of her (I don’t know why but in English, and also in Spanish, boats, ships, etc, are always related to as females). I guess by looking at the pics you can have an idea of how big it is. In case you still don’t think it’s big, believe us, it is a monster. Even though we had heard that nobody was allowed to get close to it, we ventured in the Marlin Marina to see how far we could go and, if possible, take a few pics so we could share them with you. And we couldn’t see anybody stopping us from getting close, in fact, there were lots of people taking photos and even chatting to one of the crew who was mopping the floor of the ship while, I guess, the rest of the crew were having fun. Tough life!!! But she’s beautiful, isn’t she? She belongs to Jim Clark, founder of Netscape and Silicon Graphics and the price to build her was $90 million. 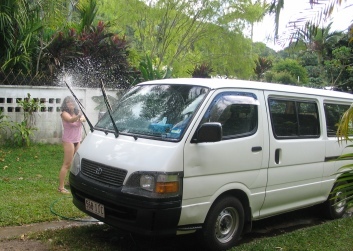 What makes the Athena so interesting, apart from her measurements, is that she’s for rent. 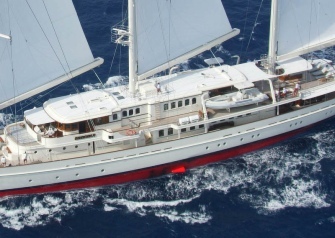 Anybody can rent her, providing they have US$500,000 a week. Let’s see, that’s AU$600,000 or 360,000 euros a week. We’re thinking about it, but we haven’t decided where to sail her yet, so we’ll drop the subject for the time being. But it has inspired us to build a new page for Cairns Unlimited. Check out our new BOAT HIRE page. 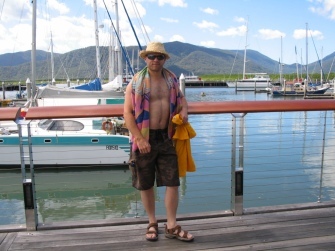 This entry was posted on Sunday, July 29th, 2007 at 1:50 pm	and is filed under At home in Cairns. You can follow any responses to this entry through the RSS 2.0 feed. You can leave a response, or trackback from your own site.